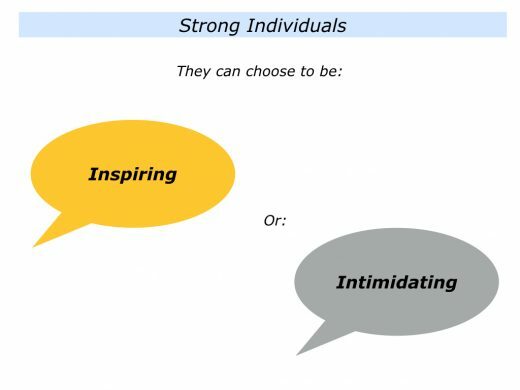 Strong individuals can choose to be inspiring or intimidating. The choice they make has consequences – both for themselves and other people. This is a scenario I have encountered several times when doing mentoring sessions. Virtually all of my work has been with people who have asked for such sessions. On some occasions, however, I have had people ‘sent to me’. This can be challenging. The first step is to make the person feel welcome and outline what it is possible to cover in the session. One approach is to explain it is possible to offer them practical tools they can use to achieve their picture of success. To explain your role and their role in working to achieve their goals. It important to establish if they are prepared to do what is required to achieve their picture of success. The third step is to help the person to build on their strengths and offer them practical tools that work. It is then to encourage, educate and enable them to achieve their picture of success. Every person can choose to encourage or discourage people. Looking at your own life, can you think of a situation when you chose to be inspiring rather than intimidating? This could have been in your personal or professional life. You may have felt passionate or upset about something in your role as a parent, educator, leader or in another role. Looking at the situation, you had a choice regarding how you expressed your feelings. You could try to channel them in a positive way to help and encourage people. Alternatively, you could channel them in a negative way and hurt or frighten people. If possible, think of a situation when you tried to inspire people rather than intimidate them. You may have chosen to buy time, clarify your options for going forward and consider the consequences. Looking ahead, you may have explored some of the following questions. What are the real results I want to achieve? How can I do my best to achieve those results? What do I want people to be feeling afterwards? What are the actual words I want them to be saying? Bearing these things in mind, what is the route I want to pursue? What are the key messages I want to give to people? How can I communicate these in a positive way? Settling on your chosen option, you may then have rehearsed your plan of action. Clicking into action, you may then have tried to encourage rather than discourage people. 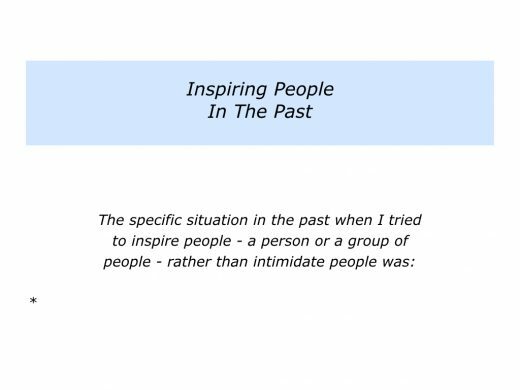 Describe a specific situation in the past when you tried to inspire people – a person or a group of people – rather than intimidate people. Describe the specific things you did to try to inspire people. 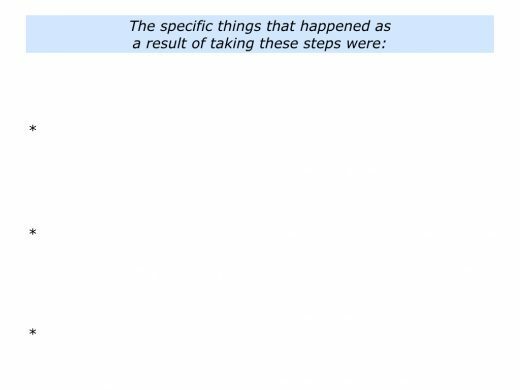 Describe the specific things that happened as a result of you taking these steps. As mentioned earlier, I normally work with people who take the initiative to ask for sessions. On this occasion, however, the company asked me to work with Tom, a potential peak performer. I agreed, but on the condition that it would be important to make clear contracts with him. He must want to tackle the particular challenge and work towards achieving an agreed picture of success. Tom, a top sales person, wanted to become the Sales Director. He was great with customers and always exceeded his targets. In some interactions with colleagues, however, he came across as dismissive. During meetings he talked across others and did his emails whilst they were talking. He had a dynamic personality and could energise people, especially when talking about future possibilities for the company. On the other hand, he could also be destructive. Such swings in behaviour raised question marks about whether he could achieve his ambition to be Sales Director. Bearing this in mind, the company asked if I would see him. The first step would be to see if he really wanted to tackle the challenges. If so, we could then work together to find solutions. Tom and I met for an initial chat. After a few minutes I explained the deal regarding us potentially working together. Here is a summary of the things I said to him. As you know, the company has asked you and I to meet. This is because the company believes you have the ability to be a Sales Director. If you want to achieve that position, however, there may be certain things you may need to tackle. You have a strong personality and can be very inspiring. On some occasions, however, you may also be intimidating. Bearing this in mind, you may face a choice about the possible roads you want to travel in your career. You are superb with customers. As far as I understand, you prepare properly for those meetings and make the customer feel the centre of your world. You listen to the customer, clarify their goals and then share ideas to help them achieve success. These are skills that, if you wish, you can also use to help your colleagues. Looking ahead in your career, you will always get a job in sales and make lots of money. If you want to be considered for a Sales Director role, however, you may need to explore how you can build a good reputation with colleagues. You already have the skills to make this happen, because you use these with customers. It is up to you to decide if you also want to use them with colleagues. If so, we can work on how to make it happen. So I would like you to take a bit of time to reflect and look at the possible ways forward. You can certainly continue in the same way with customers, hit your targets and make money. If you want to be considered for future promotion, however, it may be useful to consider how you want to use your skills to support your colleagues. If you want to take this second route, we can work together. The aim will be to provide tools you can use to build on your strengths and manage the consequences of any weaknesses. Let me know which route you want to follow. Tom said that he wanted to lead large teams. This involved behaving in a professional way towards all people. Sometimes this might be difficult if he got impatient with people, but there were skills he could learn to deal with such situations. On occasions this might involve learning how to channel his personality rather than change his personality. Tom and I made a contract to work together towards achieving his picture of success. There are many views about what motivates people to change their behaviour. Some individuals change, for example, when they feel that doing so may bring them more pleasure and less pain. A person must have the will, of course, before they can learn a skill. So what is it that motivates people to develop the will to alter their behaviour? Some people spend a lot of time trying to convince others they should change. They may try to persuade another person or try to find some trigger that will get the person to alter their behaviour. This approach can come across as criticism and be counter-productive. The person on the receiving end can feel attacked and responds badly to such messages. To focus on the consequences of their behaviour and clarify if they want to continue to have those consequences. To focus on the desired consequences – the real results – they want to achieve. To, if appropriate, help them to explore how they can do their best to achieve these desired consequences. Tom and I clarified the consequences – the outcomes – he wanted to achieve. 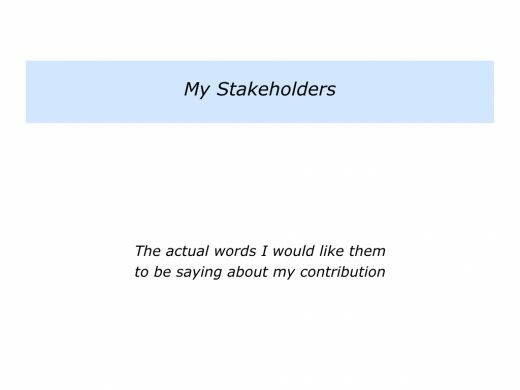 He began by tackling the exercise called My Stakeholders. This involved him going through the following steps. Clarifying the key stakeholders he wanted to satisfy – such as his bosses, team members and customers. Clarifying the actual words he wanted them to be saying about his contribution. Clarifying how he could do his best to ensure they were saying these things. Tom described the actual words he wanted people to be saying. 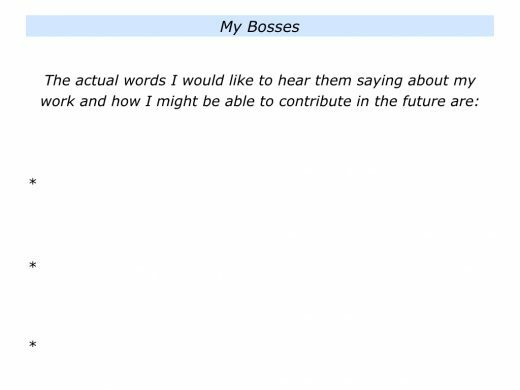 Looking at his bosses, for example, he wanted them to be saying the following things about his contribution to the company. Tom continues to hit his sales targets, is good at managing upwards and gets good feedback from his colleagues. He is showing he has the ability to be a good Sales Director. He has become more strategic and makes positive contributions to senior team meetings. Tom is good at managing all his stakeholders. He keeps people informed about his department’s progress and makes sure there are no surprises. He is good at finding solutions to challenges and also works well with other key people across the company. Tom is well regarded by his peers and team members. They say that he shows them respect, listens to their views and does practical things to help them reach their targets. He has become a respected colleague and people see him as a good contributor to the company. Tom focused on each group of stakeholders and described the desired outcomes. He then made action plans for doing his best to achieve these aims. This involved working through the following exercise. Tom worked through each of the sections and explored how to get some quick successes. He could draw on the skills he used with external customers, for example, and apply these to his interactions with internal customers. Previously he had not seen the point of taking this step, but his dismissive approach had produced lots of collateral damage. 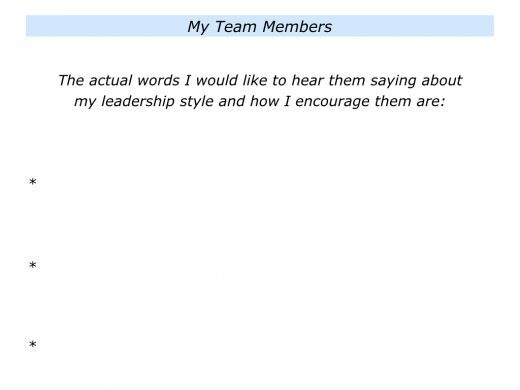 He now saw how it would be beneficial to help his colleagues and peers to feel valued. Different people cite different reasons for changing their behaviour. People are more likely to take this step, however, if they believe that doing so will increase their chances of success. This was the route taken by Tom. Let’s return to your own life and work. Looking ahead, can you think of a potential situation in which you could choose to inspire or intimidate a person or a group of people? This could be in your personal or professional life. It could be one that may be challenging, concerning or critical. You may feel under pressure, for example, and depend on other people to deliver the goods. The way you behave in the situation can encourage people or make them fearful. Looking ahead, how can you buy time to think and clarify the possible ways forwards? How can you settle on your chosen strategy? How can you then encourage rather than discourage people? 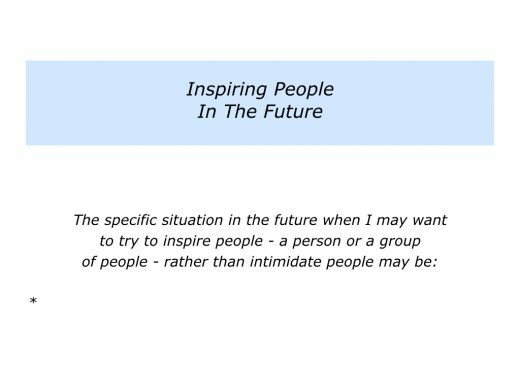 Describe a specific situation in the future when you may want to inspire people – a person or a group of people – rather than intimidate people. Describe the specific things you can do to try to inspire people. 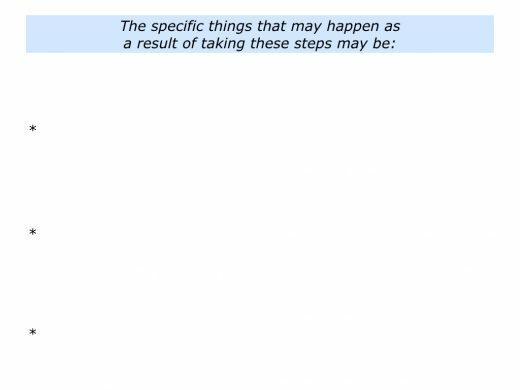 Describe the specific things that may happen a result of you taking these steps.